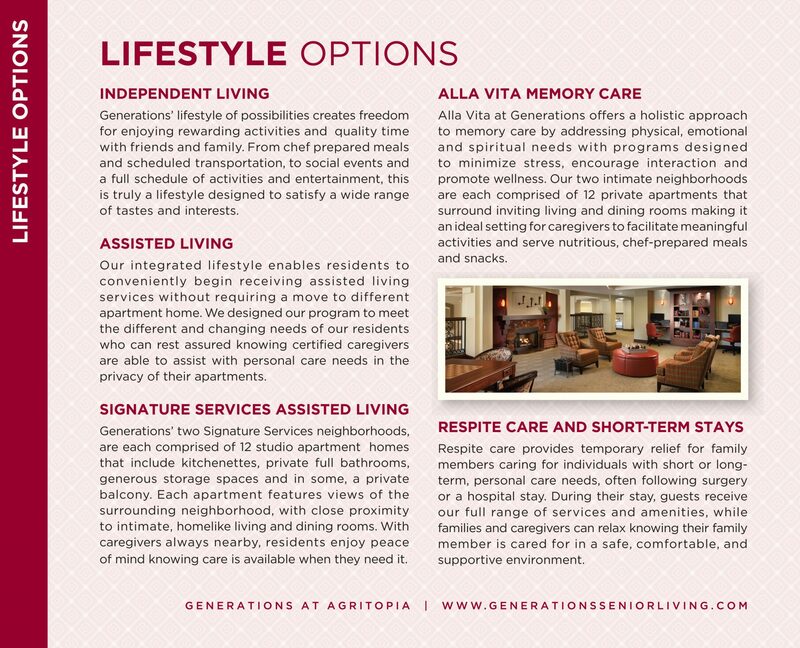 The village of Agritopia embodies our human nature’s deep-seated desire for comfort, security and connection. 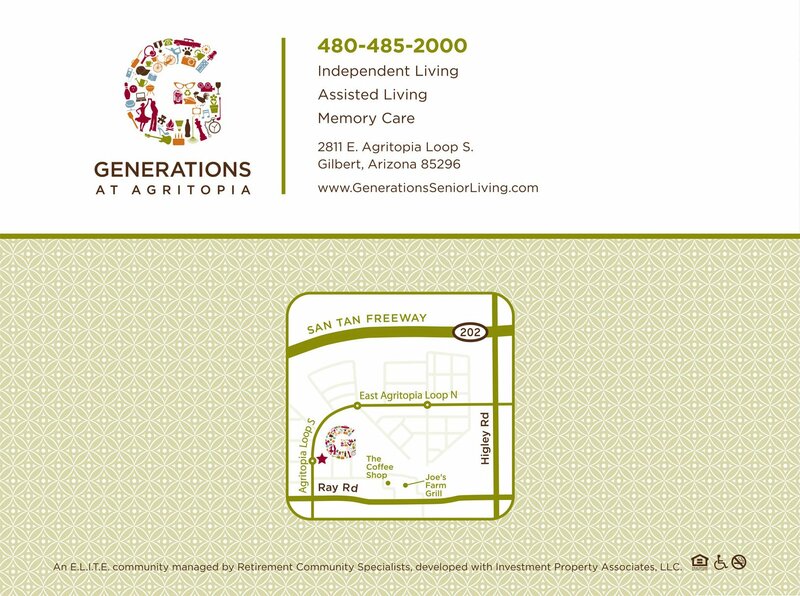 Its visionary founder, Joe Johnston, upon whose boyhood family farm the community resides, has created a quiet, close-knit rural village within the coveted community of Gilbert, Arizona. 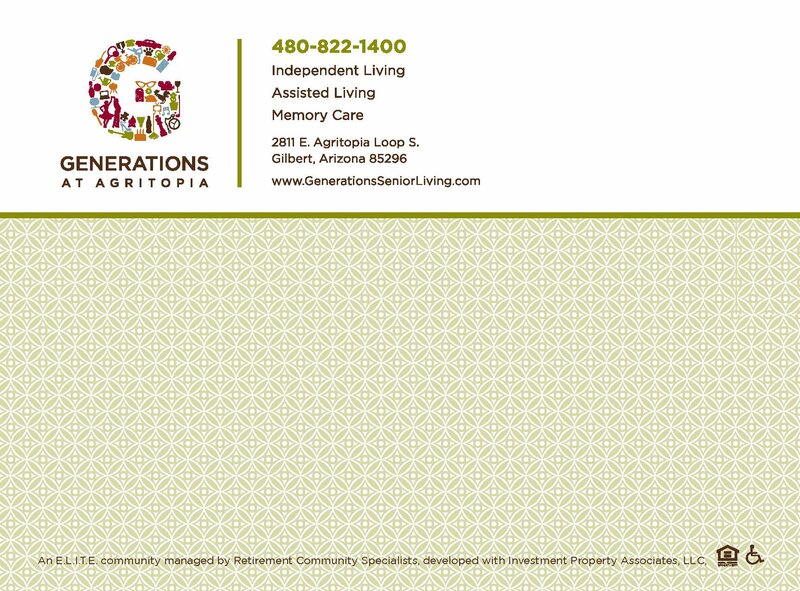 Sales kit for leasing office to sell to prospective residents of Generations at Agritopia, a senior living community nestled in the unique Gilbert, Arizona community called Agritopia. Kit includes a custom folder with a 16-page sales brochure, which was created pre-construction stage using high quality, realistic architectural renderings of the anticipated finished space. Also included are stair-stepped inserts allowing for easy updating in the future. 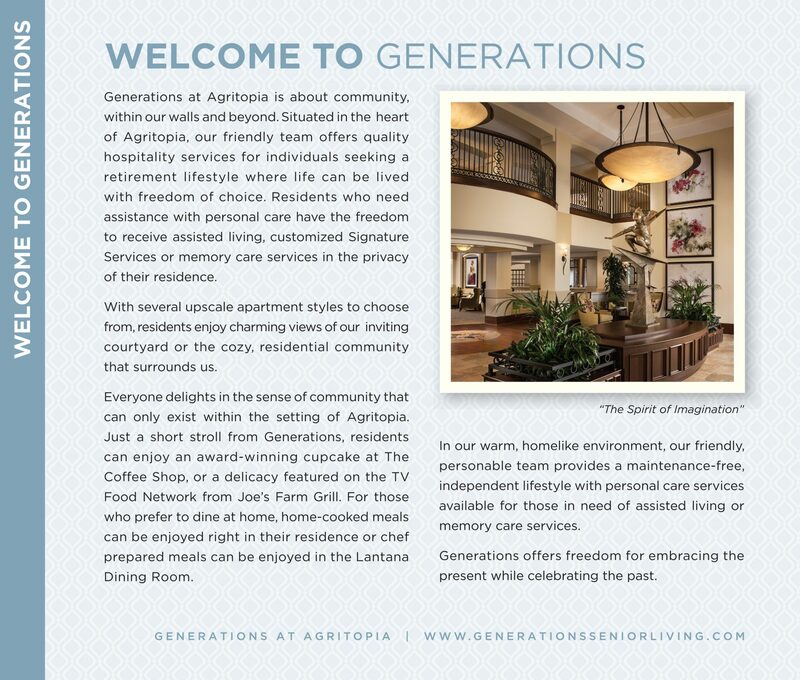 From the beginning, Agritopia was designed to bring people together in meaningful ways reminiscent of small town life in an earlier time. 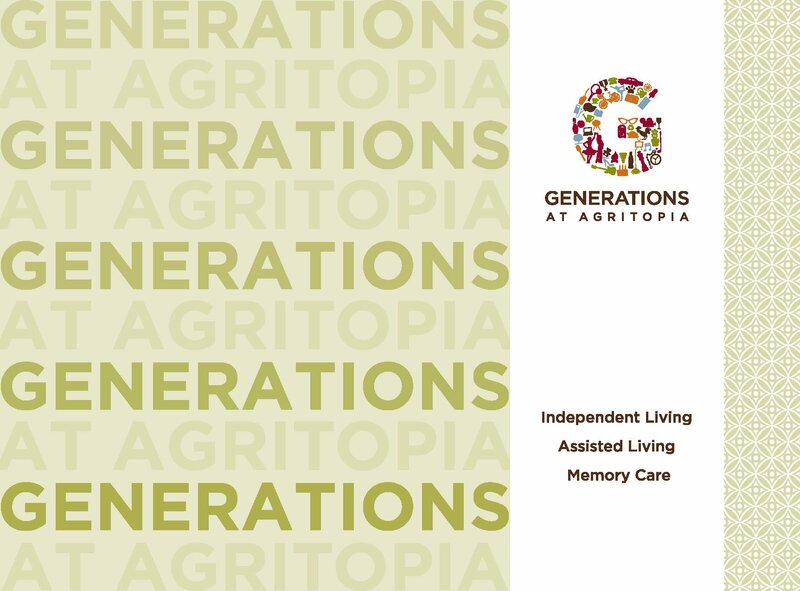 Generations at Agritopia moves Joe Johnston’s vision closer to a true multi-generational village community to be revered by residents for generations to come. 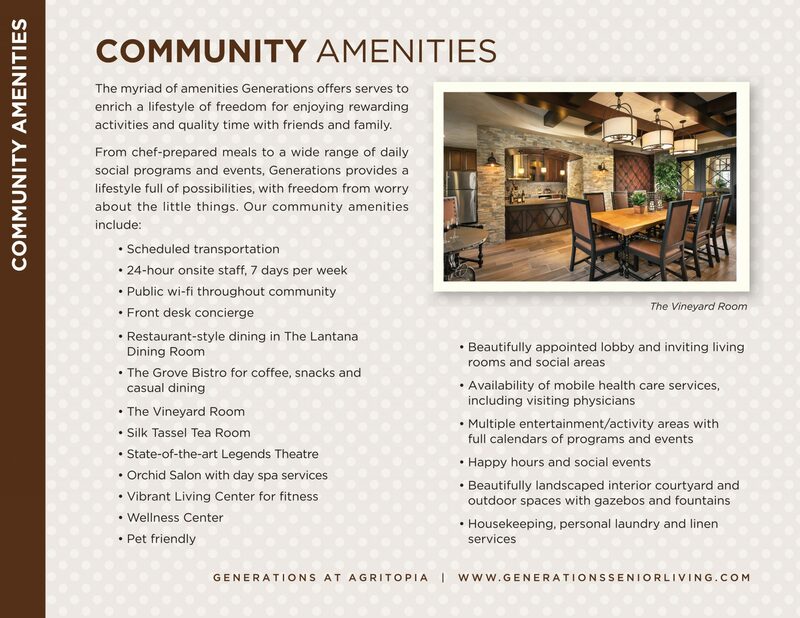 At the heart of Agritopia are the working farm, community gardens and orchards, which supply nutritious, certified-organic food for the community’s nationally recognized restaurants, honor-system produce stand and Generations Senior Living Community. 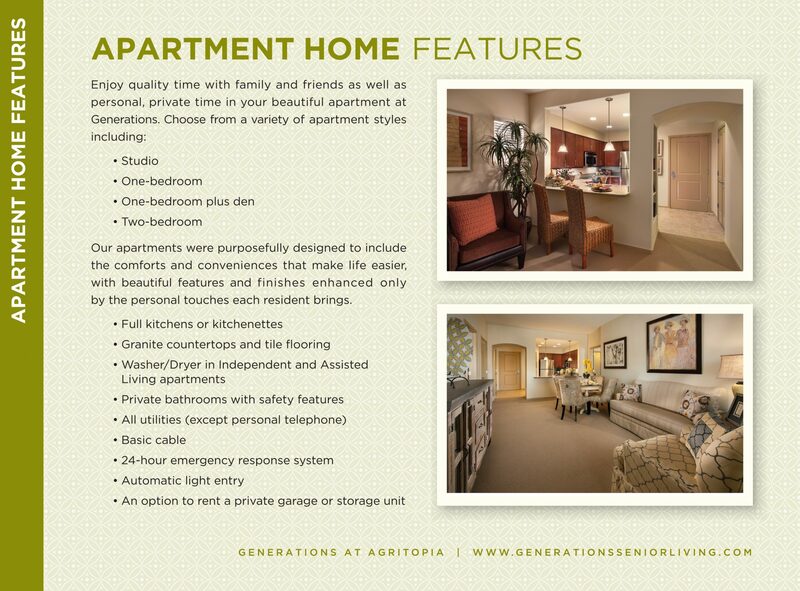 As its name implied, one of the hallmarks of life at Agritopia includes convenient access to delicious, fresh, locally-grown produce. The Western States Printing Alliance (WSPA) annual Print Excellence Competition provides a forum for recognizing those companies that have combined craft with technology to produce outstanding printed material. The competition’s grand finale is the selection of the “Best Of” awards. The criteria for judging: registration, clarity and neatness, sharpness of half-tones and line drawings, richness and tonal qualities of color, paper and ink selection, ink coverage, difficulty of printing, effective contrast or softness, overall visual impact, finishing, and finally, design and typography. The Western States Printing Alliance (WSPA) is a non-profit trade association dedicated to providing a variety of benefits and money saving programs to print, creative, web media, and marketing businesses. WSPA is an affiliate of Printing Industries of America. WSPA proudly serves the Arizona, Colorado, New Mexico, and Wyoming region. 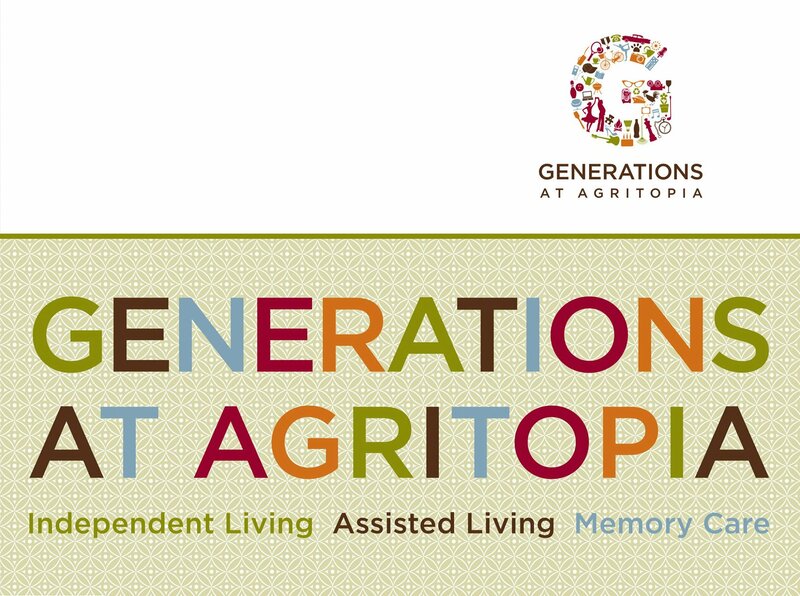 Since the Generations at Agritopia brochure won gold in this competition, it was elevated to the Premier Print Awards competition in Pittsburgh. Congratulations also to Cereus Graphics and Fuzion Visual Engineering who printed this piece, and specifically Kevin Kendrick.